Amazing Any DVD Ripper software can convert all popular video formats including AVI, H.264/AVC, FLV, WMV, MP4, MPEG, RM, MOV, XviD, 3GP, VOB, ASF, DV, HD AVI, HD MPEG-2/4, HD H.264/MPEG-4 AVC, HD WMV, HD Quick Time, HD VOB, HD ASF video, 3D video and more. It allows you to rip to DVD audio files like FLAC, WAV, WMA, AAC, ALAC, AC3, AIFF, AMR, AU, MP3, so that you can play them on iPhone, iPad, iPod, MP3, Mobile phone and more media players. 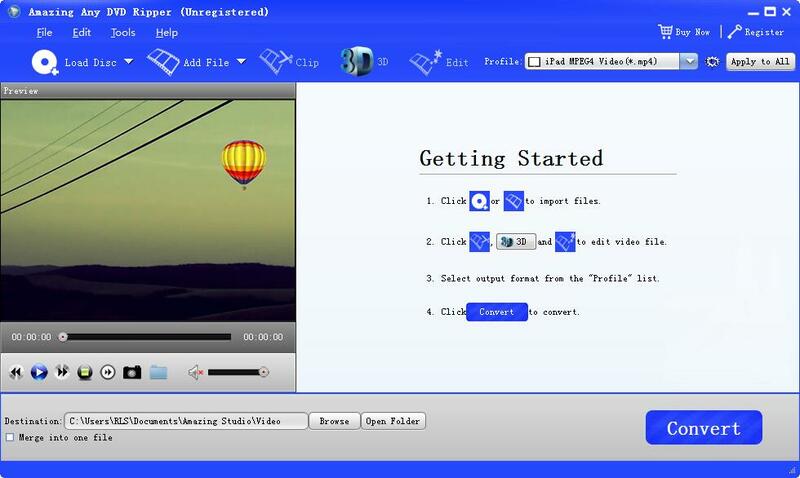 This professional DVD Ripper application allows you to edit DVD contents before DVD conversion. 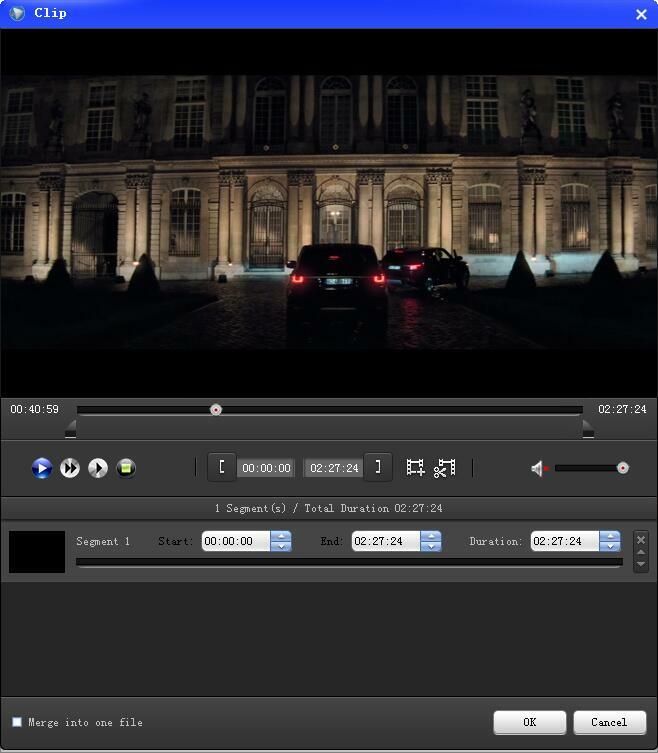 You can clip video by setting the start time and end time and merge several clip files into one, crop video, adjust video brightness/contrast/saturation/hue, add text and picture to video as watermark, etc. After the DVD ripping, you can enjoy movies on computer and media players like iPad, iPhone, TVs, Android phones, mobile phones, Samsung, Sony, Huawei mobiles, tablet PC, Gaming consoles, etc. Amazing Any DVD Ripper is your best choice to backup DVDs to local computer hard drive, USB flash drive, External hard drive, SD card and other removable storage devices, rip DVD to movies for watching on computer and portable media players, rip DVD to video for editing software. 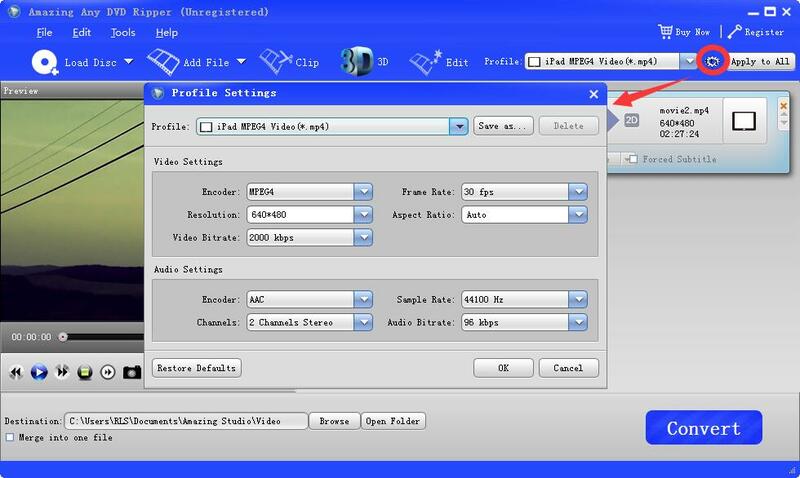 3 Steps you can rip a DVD on computer: Step 1, download, install and run Amazing Any DVD Ripper software and then load DVD Disc, DVD Folder or IFO Files; Step 2, edit DVD contents; Step 3, select output video/audio format and destination where you save the file and then click "Convert" button to start DVD ripping. Clarence - With it, I can enjoy my favorite DVD movies on my iPhone easily. Bunny - Convert DVD to MP4 with lossless quality.